"Frequently asked questions" and "to do list"
20120401 Agile project management for Protei. Scrum -> Kanban. 20120719 Protei is at TechShop : Build your dreams! And now the Sail ! Application to "The Future of Water"
Earthrace, the biofuel-powered boat designed to pierce waves, circumnavigates the globe in 61 days. 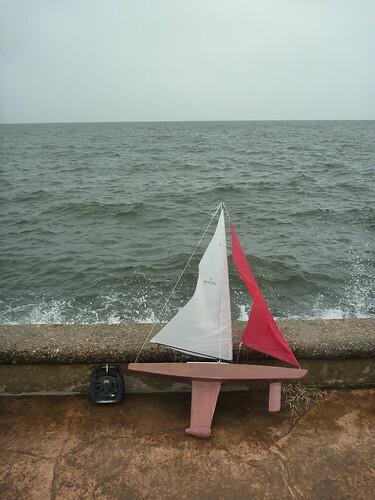 Follow the launch of an autonomous sail boat tomorrow ! New Mast and Boom from Eurofun! Oil Spill in the North Sea NOW ! Protei 5.1 [Alien] by Rotterdam Bridge! Protei controlled via Android - via a web browser? Why not, said Electropig. Protei in DNV "We Magazine"
Protei in the New Scientist ! Protei wins 2012 ARS Electronica Honorary mention for "Hybrid Art"
Protei_007 _008 _009!!! Keep it coming! Protei_007 by Gabriella Levine wins 2nd place at ShopBot contest on Instructables ! Sailing and Oil Boom Testing! The Little Submarine that could ! Update #12: Starting to prototype new ideas! Update #14: Protei to the water! 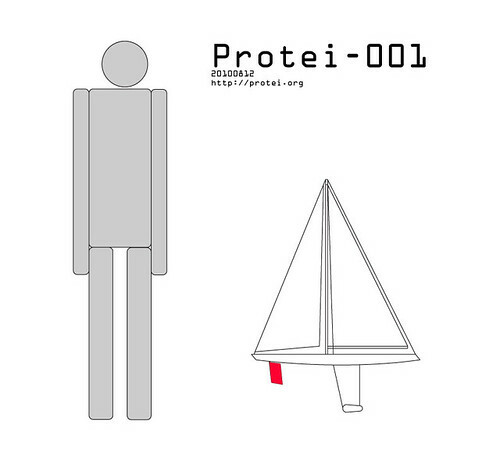 Update #19: Protei World Premiere, Handbook ! What's Going On At The Bottom Of The Gulf ? 008 A "Canary" & B "Bubble"
Protei is an unmanned shape-shifting sailing robot developed Open Hardware by a global community of makers called Open-H2O (former Open_Sailing) the collective randomwalks and Amorphica. Protei has no rudder nor centerboard : the entire hull bends to control this sailing robots providing it unprecedented sailing properties. Originally developed to clean up oil spill, Protei will be used to measure radioactivity, plastic debris, monitor fisheries, coral reefs, algae blooms, provide general oceanographic data or serving as surface satellite link to underwater vehicles. Protei has been produced by the V2_in Rotterdam, NL. Protei has been generously funded by over 300 backers on Kickstarter. Everyone is welcome to join, contribute, modify, produce, distribute the design and share their findings. Can a little Sail boat pull a long tail? A heavy payload? A normal back steering with a classical rudder is not efficient no more when pulling a long heavy load -> What about a front steering? Would it help? The answer is : YES!